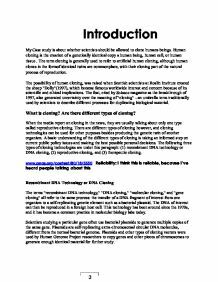 Introduction My Case study is about whether scientists should be allowed to clone humans beings. Human cloning is the creation of a genetically identical copy a human being, human cell, or human tissue . The term cloning is generally used to refer to artificial human cloning, although human clones in the formof identical twins are commonplace, with their cloning part of the natural process of reproduction. The possibility of human cloning, was raised when Scottish scientists at Roslin Institute created the sheep "Dolly"(1997), which became famous worldwide interest and concern because of its scientific and ethical implications. The feat, cited by Science magazine as the breakthrough of 1997, also generated uncertainty over the meaning of "cloning" --an umbrella term traditionally used by scientists to describe different processes for duplicating biological material. What is cloning? Are there different types of cloning? When the media report on cloning in the news, they are usually talking about only one type called reproductive cloning. There are different types of cloning however, and cloning technologies can be used for other purposes besides producing the genetic twin of another organism. A basic understanding of the different types of cloning is taking an informed step on current public policy issues and making the best possible personal decisions. The following three types of cloning technologies are under this paragraph: (1) recombinant DNA technology or DNA cloning, (2) reproductive cloning, and (3) therapeutic cloning. www.pnas.org/content/80/18/5550 Reliability: I think this is reliable, because I've heard people talking about this Recombinant DNA Technology or DNA Cloning The terms "recombinant DNA technology," "DNA cloning," "molecular cloning," and "gene cloning" all refer to the same process: the transfer of a DNA fragment of interest from one organism to a self-replicating genetic element such as a bacterial plasmid. The DNA of interest can then be reproduced in a foreign host cell. This technology has been around since the 1970s, and it has become a common practice in molecular biology labs today. ...read more. Therapeutic cloning technology may some day be used in humans to produce whole organs from single cells or to produce healthy cells that can replace damaged cells in degenerative diseases such as Alzheimer's or Parkinson's. Much work still needs to be done before therapeutic cloning can become a realistic option for the treatment of disorders. campus.queens.edu Reliability: I don't think this info is very reliable because this site isn't counted as a good one. What animals have been cloned? Scientists have been cloning animals for many years. In 1952, the first animal, a tadpole, was cloned. Before the creation of Dolly, the first mammal cloned from the cell of an adult animal, clones were created from embryonic cells. Since Dolly, researchers have cloned a number of large and small animals including sheep, goats, cows, mice, pigs, cats, rabbits, and a gaur.. All these clones were created using nuclear transfer technology. Hundreds of cloned animals exist today, but the number of different species is limited. Attempts at cloning certain species such as monkeys, chickens, horses, and dogs, have been unsuccessful. Some species may be more resistant to somatic cell nuclear transfer than others. The process of stripping the nucleus from an egg cell and replacing it with the nucleus of a donor cell is a traumatic one, and improvements in cloning technologies may be needed before many species can be cloned successfully. www.Lite.org/AB/GG/inserting Reliability: I don't think this is reliable too because it doesn't say all the animals. http://www.ornl.gov/sci/techresourcesf Reliability: this diagram is very reliable because it describes all the steps which are true Cloning Methods Here are 3 main methods of cloning, which are briefly outlined here in three different sections. The Process of Nuclear Transfer Nuclear transfer is the process of creating an embryo by fusing an adult animal cell, in an udder cell from a human, into an enucleated egg cell. 1. ...read more. A cloned embryo would be produced as a means to other ends. It has no parents in the ordinary sense of the word. The person supplying the genetic material would be more like a twin than a parent, leading to identity problems for the child. One more reason for not cloning human beings is because of the "soul" factor. If you cloned yourself, who or what soul would be in the clone? Would your soul share two bodies? These are some of the questions that are raised when speaking on a spiritual point of view. Moving on to something more "real", we come to the fact that a human clone can have many possible applications. The first thing that comes to mind for most people is "immortality". Cloning yourself means that you can have a "bag of spare parts" that will be available when you get into trouble. Say you have a heart attack and you need a transplant, your clone will have the perfect donar heart. Is this murder? Is this acceptable? Eventually, it might be possible to actually transplant your brain into a clone body and then you will be young again. (This is the true fountain of youth). What implications does this have on society? Would this mean over population? Are clones people? Should they be used like this? If you look at cloning animals, none of these issues arise. This is because animals usually aren't considered to have a soul. It is acceptable to kill animals (to eat, for medical reasons, etc.). cloning can be good in this case because you can clone endangered species or even extinct species a la jurassic park. This is probably a benefit to society. For me, I think cloning is the way to go. With all technologies there are always good and bad things. It is how we use them that makes it good or bad. The technology itself is not bad. Reliability: these are my opinions, so I can't say they're reliable or not . Websites: www.aph.gov.au/House/committee/laca/humancloning/sub17.pdf www.ama-assn.org/ama1/pub/upload/mm/369/report98.pdf www.rpi.edu/dept/chem-eng/Biotech-Environ/cloning/ http://www.buzzle.com/articles/human-cloning-benefits.html www.accessexcellence.org/AB/GG/inserting TV channels: BBC News 27/09/06 Sky news 8/06/07 Gov tv13/12/04 http://skyscape.sky. ...read more. We also have cranial reflex arcs. These are reflex arcs that have the relay neurone in the brain rather than the spinal cord, but they are still automatic and not under conscious control. E.g. pupil size - automatically adjusts to the light In some cases the brain can modify a reflex response e.g. This is unpleasent for the child to have extra discomfort and it is difficult for the parents to complete. It also means the child is exposed to the diseases for another crucial five years, in which they are most exposed to pregnant women, who it is very important don't get rubella. Stem cells are crucial in therapeutic cloning because they are unspecialized cells, which means that they can be made to become any type of specialized cells in the body. However using embryonic stem cells are controversial because the embryos they are taken from are destroyed by the extraction process. This situation is exacerbated by energy hungry cells sending emergency signals to the liver to release stored glucose. The symptoms of type 2 diabetes are similar to type 1 but their onset is slow and some people have no symptoms at all. to be worried about, unless you admitted to hospital that is, well this is how many sources see the situation. The bacteria can be present on the body but it doesn't have to cause any harm. Doctors also call this being 'colonized' with MRSA.